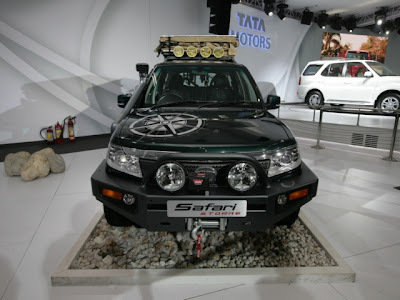 While Tata Motors unveiled the new and sportier Tata Safari Storme at the Delhi Auto Expo 2012 held in January, they didn't announce the launch date of the vehicle. Maybe it was a conscious decision, a marketing gimmick, or just plain oversight! In any case, everyone was speculating about the launch date of the Storme. So, Tata Motors has taken mercy on poor souls like you and me, and finalized the launch time of the SUV. You can expect it to be ready for sale in September. According to sources, the to-be-launched Tata Safari Storme will be a more refined than the done displayed at the Auto Expo this year. Though Tata's aren't retiring the current Safari SUV, the Safari Storme will be more premium than its predecessor. Expected to be priced in the bracket of Rs.9L to Rs.12L, the new Safari is going to compete with hot-sellers like Mahindra Scorpio, Renault Duster, and Ford EcoSports (to be launched next year). A completely different animal, the all new, fresh looking, Tata Safari Storme is ready to hit the Indian roads and create a storm!